ready to explore local food culture? Experience culinary storytelling, with new flavors and unheard stories. restaurant feasts, creative pop-ups, cooking competitions, classes, and more. Join us to Experience Food Differently! I'm Ready to #EatKomeeda ! I'd Like to Host An Experience! We’re redeveloping the Komeeda experience for restaurants and chefs to easily connect with food lovers seeking to explore local food culture. Have the flavors of Komeeda at your next event. Looking for drop off, partial or full-service catering? Connect with us here! Food lovers can find creative pop-up feasts, restaurant tastings and feasts, culinary competitions and other fun food events. Search for the tastes and the environment of your liking! All experiences are hosted by food makers who want to share their culinary passion, and also want to share the experience of making it. Secure your seat with the click of a button. Come with an empty stomach and leave with an enriched taste palate. Hang with the chef, storytelling hosts, make new friends, or come with old ones. No bills to split either. It's cake! Experience food differently with a food-loving "Kommunity". We cater to food lovers who are passionate about food and seeks to experience it in a different environment. 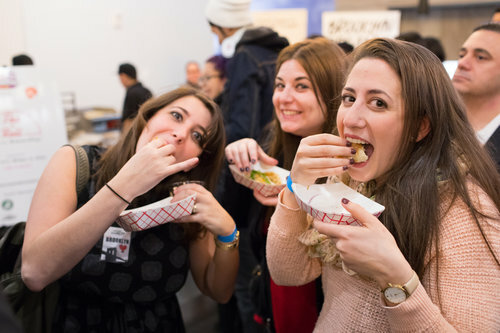 Providing our kommunity members fun ways to discover top tiered chefs and innovative restaurants, taste creative and cultural cuisines, and interact with storytelling chefs, hosts, and fellow eaters. Whether you're a food adventurer, gourmand, or foodie, a local, transplant, or tourist... Komeeda provides the hungry food-lover experiences that are unique, eclectic, and most importantly, flavorful! We welcome you to join our inclusive kommunity that feels exclusive. Chef Shuchi sharing her #eatKomeeda experience with the Kommunity at Dinner Under the Bridges. Food is the center of our universe. We provide a stage for rising and established chefs and restaurants to experiment with food and share stories to connect with our Kommunity. Experience the soul of the restaurant with us! Feast on robust menus featuring 6+ items at each gathering led by a dedicated host. Get access to the stories and secrets shared by head chefs, restaurant managers, and owners. Immerse yourself in culture, innovation, and creativity at the table. Our pop-ups are centered on spotlighting local talent and showcasing the secrets of local food cultures. Taste untasted foods, hear unheard stories, and experience the unexperienced. You be the judge! Attend our competitions to eat, drink, and vote for the next Kommunity Champion! Featuring rising and talented kommunity chefs and eateries showcasing their best bites for you to get your fix of culinary innovation! They've Been Talkin' About Us! I’ve been going to Komeeda events since the beginning and each event is truly unique and wonderful. It’s a guaranteed good time with the best people and delicious food. I’m super excited to see what Komeeda brings in the future. These events are awesome! I get to explore food in a socially engaging environment. I get to taste new cuisines conveniently. "Being able to work with Komeeda has given me the opportunity to bloom my passion with food with new faces and open hearts. It has grown to more than just camaraderie, it has turned into family." Jane P., Kommunity Chef Showdown II Champion. "I love komeeeeeda! They're super fun and unique thing to do in NYC. It's a perfect environment for everyone! Over the past few months our dear friends at the Center for International Private Enterprise (CIPE) have launched the LIFE project, a State Department backed initiative to help Syrian and Yemeni refugees launch their culinary startups. Komeeda teamed up last month with CIPE to travel to Turkey to mentor LIFE resident entrepreneurs and participate as a judge of the competition which provided funding to three startups. Komeeda is proud to support CIPE and their efforts to help refugees in Turkey reach economic security through food. We will be sharing updates on this great initiative regularly. Hungry? Reach out to us for all inquiries! We will get back to you within 48 hours. Thank you! We will be in touch soon! In the meantime, head to our Facebook Kommunity page here!